What are the implications for the Authorship Question of Shakespeare’s profound knowledge of Renaissance Neoplatonic and Hermetic traditions? These are present not only in passing allusions but also in the deep structure of his dramas, open to interpretation as allegories of initiation, transformation and regeneration. Time: 11:00 – 18:00 (Tea and coffee available from 10:30) Venue: Shakespeare’s Globe, The Sackler Studios*, on the corner of Bear Gardens and Park Street, Bankside, London, SE1. 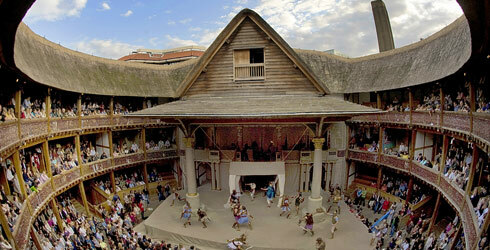 *Note change of venue in 2012 due to building of the new indoor Jacobean theatre at the Globe. The Lost Word and Swan Song: Rosicrucian and Baconian Themes in Shakespeare’s comedies and romances. Shakespeare’s Physic: Hermetic and Alchemical Magic in The Winter’s Tale, Pericles and All’s Well that Ends Well. Shaking the Spear: The Hermetic interests of the Sidney/Pembroke Circle with special reference to Cymbeline. Death’s A Great Disguiser: Resurrecting Shakespeare.